Gobies are the largest family of marine fishes with about 1,800 species! 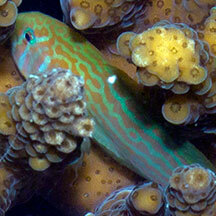 Some gobies live with snapping shrimps, others in corals. They are well camouflaged. Watch your step! Where seen? 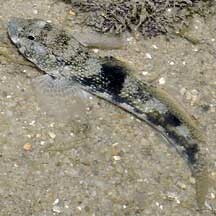 Gobies are abundant on many of our shores. But they are hard to spot. At the slightest sign of danger, they bolt into burrows or dart under rocks. Even in plain sight, they blend in with the sand and mud. So watch your step or you might squash a tiny fish! Besides those that are found in pools, another kind of familiar goby found on our shores are the mudskippers that hop around on mud and rocks. What are gobies? 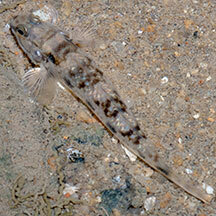 Gobies may be small but they are superlatives in several senses. They belong to possibly the largest family of marine fishes. According to FishBase: the family Gobidae has 212 genera and 1875 species! 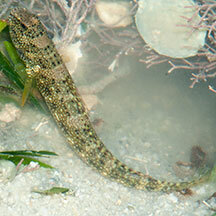 Gobies are found in tropical and subtropical areas, including some freshwater species. 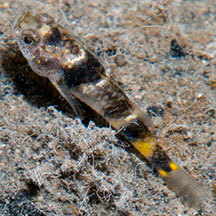 Because they are small, shy and well camouflaged, new goby species are being discovered all the time! The Family includes among the smallest fish and vertebrate: Trimmatom nanus, which reaches only 0.8-1cm long and is found in the Chagos Archipelago and Maldives. Features: 5cm or smaller, but some may grow to 10cm. 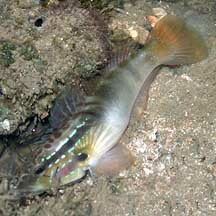 Many gobies are adapted for bottom dwelling, feeding mainly on small animals. Most are not fast, long-distance swimmers. Their bodies are cylindrical rather than streamlined, and they lack a swim bladder. They usually have large eyes high up on the head to keep a look out for danger from above. The pelvic fins are often fused to form a suction pad to grip surfaces. What do they eat? As a group, gobies eat a wide variety of things from small animals to fishes. Many filter microscopic animals from the sand. Some hover in water to eat plankton. 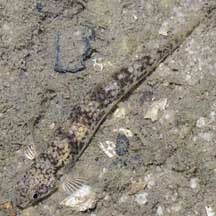 Goby babies: In some goby species, the male guards the eggs and the young stay close to dad for a time after hatching. Mums rarely participate in parental care. The elongated, club-shaped eggs are stuck onto a surface, usually inside a burrow, crevice, empty shell or other safe place. Some species may change gender, and a few may be simultaneous hermaprodites (each fish has both male and female reproductive organs). Fishy friend: The shrimp goby lives in the same burrow with a snapping shrimp. 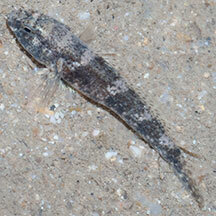 With keener eyesight, the goby keeps a look-out while the shrimp busily digs out and maintains their shared home. The shrimp is literally constantly in touch with the goby with at least one of its antennae always on the goby. When the goby darts into the burrow, the shrimp is right behind it! More about this shrimp-fish partnership. Other tiny gobies found in coral reefs live in close association with other animals, taking on the colours and patterns of their 'partners' for perfect camouflage. Such tiny gobies may be found among the branches of sea fans, or on sponges and corals. Some gobies (Gobiosoma spp.) perform 'cleaning' functions on larger fishes and other marine creatures. These gobies are usually colourful. Role in the habitat: Being relatively abundant in the ecosystems they inhabit, these small fishes are believed to play a vital part in the food chain. 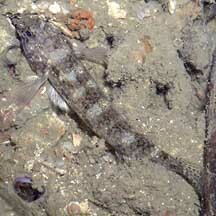 In fact, the absence of gobies may be a sign of danger to the habitat, as this study of reefs found. 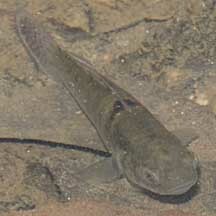 Human uses: Gobies are generally not eaten, although it is said that large mudskippers are eaten in places like Taiwan. Some of the more colourful gobies are collected for the live aquarium trade. Status and threats: None of our gobies are listed among the threatened animals of Singapore. However, like other creatures of the intertidal zone, they are affected by human activities such as reclamation and pollution. Over-collection by hobbyists can also have an impact on local populations. But most are well camouflaged. to many kinds of gobies. Mudskippers Ng, Peter K. L. & N. Sivasothi, 1999. A Guide to the Mangroves of Singapore II (Animal Diversity). Singapore Science Centre. 168 pp. Gobies, mudskippers and their relatives Lim, Kelvin K. P. & Jeffrey K. Y. Low, 1998. A Guide to the Common Marine Fishes of Singapore. Singapore Science Centre. 163 pp. Family Gobiidae and Mudskippers Tan, Leo W. H. & Ng, Peter K. L., 1988. A Guide to Seashore Life. The Singapore Science Centre, Singapore. 160 pp. Tiniest reef fishes warn of risks to reefs on the wild shores of singapore blog. Tan Heok Hui (Changi), Zeehan Jaafar (Tuas). 28 Jul 2017. 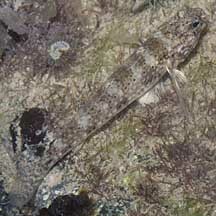 Brown drombus goby found in burrows with snapping shrimps. Singapore Biodiversity Records 2017: 98-99. Helen K. Larson, Zeehan Jaafar and Kelvin K. P. Lim. 29 June 2016. An updated checklist of the gobioid fishes of Singapore. Raffles Bulletin of Zoology Supplement No. 34: 744–757. Ria Tan & Kelvin K. P. Lim. 26 December 2014. 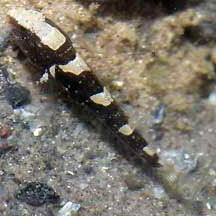 Lagoon shrimp-goby at eastern Johor Straits, Cryptocentrus cyanotaenia. Singapore Biodiversity Records 2014: 334. Tan Heok Hui, Low Bi Wei & Jonathan Ho. 11 July 014. Lesser bumblebee goby in Upper Seletar Reservoir, Brachygobius sabanus. Singapore Biodiversity Records 2014: 185. Tan Heok Hui. 6 Mar 2015. 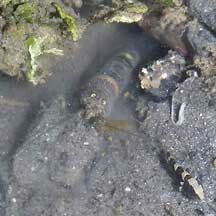 Green-spotted goby at West Coast marsh pond. Singapore Biodiversity Records 2015: 34. Jeffrey Low K. Y., Jani Isa Thuaibah Tanzil & Zeehan Jaafar, 2009. Some note-worthy fishes observed in the Singapore Straits. Nature in Singapore, 2: 77–82. Heng Pei Yan & Kelvin K. P. Lim. 15 November 2013. 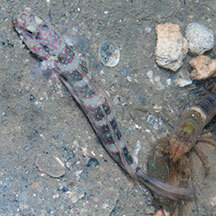 Some noteworthy reef fishes at Pulau Hantu: Ventral-barred shrimp-goby, Cryptocentrus sericus. Singapore Biodiversity Records 2013: 65-67.